:In recent decades a new movement has arisen, bringing the conceptual tools of analytic philosophy to bear on theological reflection. Called analytic theology, it seeks to bring a clarity of thought and a disciplined use of logic to the work of constructive Christian theology. In this introduction to analytic theology for specialists and nonspecialists alike, Thomas McCall lays out what it is and what it isn't. The goal of this growing and energetic field is not the removal of all mystery in theology. At the same time, it insists that mystery must not be confused with logical incoherence.McCall explains the connections of analytic theology to Scripture, Christian tradition and culture, using case studies to illuminate his discussion. Beyond mere description, McCall calls the discipline to a deeper engagement with the traditional resources of the theological task. 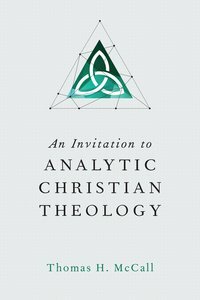 About "An Invitation to Analytic Christian Theology"
1. What Is Analytic Theology?